Dolby Atmos is the real deal surround sound solution. And that's the main motivation for considering the SJ9 soundbar: because it will bring an added dimension to your movie watching. The hot word in home entertainment at the moment is Dolby Atmos. Once the preserve of high-end cinemas, this enhanced version of surround sound has been making its way into homes, first in AV receivers, and now in soundbars too. There is a caveat of course: that Atmos through a soundbar isn't necessarily the full 5.1.2 or 7.1.2 arrangement you might expect from a separates system. But with soundbars offering a cleaner and more straight-forward solution, it's no surprise to see plenty of interest in this option. LG has taken a big step forward with Dolby over the past few year: its OLED TVs are all Dolby Vision compatible and the 2017 range also boast Dolby Atmos sound. It's therefore no surprise to find that the flagship soundbar, the SJ9, is also equipped with this audio tech. The LG SJ9 is distinctive thanks to the upfiring speakers that sit atop of the soundbar, which provide its Atmos ability. That makes this soundbar a little deep at 145mm, but it can still be wall-mounted (brackets are included), accepting that it won't sit as flush as some others. For the cleanest look, though, you may well prefer to have the SJ9 sitting on a cabinet under your wall-mounted TV. The soundbar is finished in plastics - although they look and feel pretty good quality. The grey finish is perhaps less harsh than the blacks that are typical of such products. The front of the soundbar is wrapped in a metal grille, with some horizontal detailing underneath - which we can't help feeling looks a little deco inspired. LG has been slimming down its TVs over the past few years, so matching isn't necessarily a problem. In LG's latest models there's barely a bezel to be seen, with picture-on-metal and picture-on-glass designs. The SJ9 matches the greys of older mid-range LG TVs too, as well as keeping some consistency with existing MusicFlow speakers. The subwoofer is a bit of a lump, however, as it's squared - whereas LG used to offer flatter subs. If you've got a clean room then you can make something of a feature out of it, but it's harder to tuck out of the way than the older design. It is what it is, however, and it's finished in mesh on all sides for a clean look. It's wireless, too, so you only need the power cable to get it running. The connection points for the LG SJ9 sit to the centre right (not politically) in a recessed section on the back to accommodate the connectors, so you'll be able to fit it closer to the wall, only having to bend the cables out of the way. There's an LED display hidden in the front grille that will show you the input option you're using, as well as scrolling across Dolby Atmos to confirm that it's receiving Atmos when you expect it from source. There's also a status LED that will indicate you're connected to a network. However, you can't turn this LED display off. It's not too bright, but means you'll have to live with it saying "HDMI IN" pretty much all the time. You can turn off the LED through the MusicFlow app, however, and it seems a bit strange that you can't turn off both. The remote that comes with the SJ9 very much feels like a remote that LG never intends for you to use. It's small and plastic, offering some basic controls, with more advanced controls falling to the MusicFlow app. The remote will let you do things like change the sub level or the sound mode as well as, importantly, change the input/function, which you might find you have to do more often than you want. Controls are also accessible on the soundbar itself, with a selection of buttons hidden just around the back. If you can't find that remote, then at least you can quickly make changes like changing the function, adding more speakers to the system, or changing the volume. Dolby Atmos explained: What is it and how do I get it? The LG SJ9 walks the same path as many previous LG MusicFlow soundbars. It offers HDMI in and out, with support for 4K pass-though meaning you can have your 4K device linked through the soundbar and into the TV. To say that it would replace your receiver might be a little naïve, because this arrangement has some limitations, especially if you have more than one source device. In an ideal world you'll have your best Atmos sources connected to your soundbar and into your TV. That's likely to be your Blu-ray player, although with BT TV and the Xbox One also offering Atmos too, you might need to fiddle around with the setup to get everything working. There's support for HDMI ARC from your TV (if supported by your TV, which is the case for most modern TVs), as well as optical (which won't give you the Atmos support). We found that HDMI passthrough worked great and there were no problems with running optical back from the TV either. The wireless subwoofer connection is solid and we had no dropouts during testing, which is something we've experienced on some older LG soundbars. When it comes to network connectivity, the best option is to use an Ethernet cable. We attempted to connect using Wi-Fi but the MusicFlow connection failed on each attempt - which seems to be something that has blighted the MusicFlow system since it launched. However, using Ethernet means a solid connection, which in turn means you can update the soundbar's firmware via the app, as well as access some of the more advanced controls. You'll also need to have the SJ9 connected to the network to take advantage of things like Chromecast support (for audio) or Spotify Connect. Standard Bluetooth is point-to-point, so doesn't need that network connection. That makes setup simple on the one hand, but slightly jilted on the other. There's no doubt that the SJ9 offers a lot of options, but to get to everything working, you'll have to jump through some hoops. The LG SJ9 packs a lot of power, with 500W total output, although 200W of that belongs to the subwoofer. There are then seven 43W speakers in the soundbar itself: left, right, centre, two surround speakers, and the two upfiring speakers. Although this offers the five channels you'd get in a surround sound system there are no back channels, so it's a virtualised surround soundstage. This is more convenient and tidier in one regard, although it's not as immersive a surround sound setup as you'd get from one with rear channels; equally, it's can't create the Dolby Atmos sound bubble quite as effectively either. However, this setup means that you're getting an Atmos system for under £1,000, beating the price of rivals like the Samsung K950 system that's some £300 more. And you still do get an immersive Dolby Atmos experience in the SJ9. There's a noticeable sense of height to the SJ9's delivery, so where Atmos is used to its most extreme in audio mixes you'll be able to sense audio objects placed in the room around you. Compared to a system that offers back channels, this won't quite have you thinking there's something behind you, as it's more a hemisphere effect, with the sound reaching out to envelop you, but not quite pulling you into its deep embrace. The opening scenes of Mad Max: Fury Road have become something of an Atmos cliché, but those whispering voices in Tom Hardy's head dance across the room in front of you, bringing the movie to life. If you've got a healthy modern collection of Blu-ray discs then you'll likely have some Dolby Atmos discs in there and firing up The Hunger Games: Catching Fire sees a noticeably more immersive delivery than the Dolby Digital alternative, with a feeling that you're in the action thanks to the enhanced audio. Dolby Atmos is the only format that will scroll across the LED display, although the system also supports other Dolby formats and DTS, but not the DTS:X equivalent of Atmos. Step away from those top audio formats and back to regular TV watching and the LG SJ9 acquits itself well, adding richness, definition and detail to audio, along with that essential bass boost to give it some extra meat. There are a number of audio presets to change the sound - we found Movie was our preferred setting for TV watching - as well as options for night viewing or auto sound levelling. These options are disabled once you feed it an Atmos soundtrack. The SJ9 is also a capable soundbar for music and once you've set everything up. It's a great option for things like Spotify or casting, thanks to its connectivity. It then offers you a wide room-filling sound, but when you're not listening to Atmos, let's face it, there are plenty of other soundbars than will perform just as acceptably. And hardly any music is mixed in Atmos right now (although that is changing, with REM's Automatic For The People forthcoming, as one example). Dolby Atmos is the real deal surround sound solution. And that's the main motivation for considering the SJ9 soundbar: because it will bring an added dimension to your movie watching. Atmos use in movies and music is also on the increase, so it's going to be a growing area of concern over the coming years. The all-round performance of the SJ9 is impressive; it's a great soundbar to live with. We're not entirely sold on MusicFlow as a system, however, and using LG's app for anything other than updating the firmware can be a painful experience, especially when using Wi-Fi. We're also left swearing that LG couldn't have given the SJ9 another HDMI input, just to make everything much simpler. The Samsung K950 remains a more capable and more immersive Dolby Atmos soundbar, but we'd be half tempted to pick up the LG SJ9 if that price drops a little more. 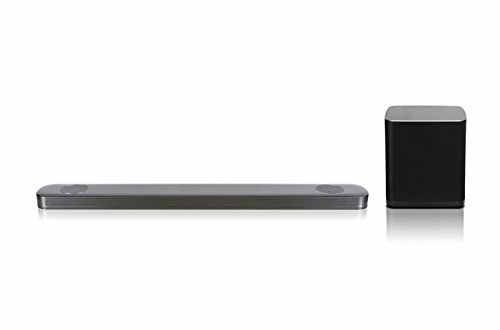 Samsung's Atmos soundbar solution uses a more comprehensive 5.1.4 system, with upfiring speakers both on the soundbar and on rear speaker too. These rear speakers are wireless, so it's a doddle to set-up, although they're not the most delicate of speakers and the looks are rather boxy. Still, if you want that complete bubble of Dolby Atmos sound, it takes you a step further than the LG system.